New Zealanders and Australians have been coming to the Cook Islands for many years nowDrawn by the beauty of the landscape and the wonderful culture of the Cooks, it has been a travellers paradise kept secret from much of the WorldBut its a secret no more with "Traveller" online travel magazine naming our gorgeous island nation in its Travel Writers Pick List for 2015. In their “Travel writers top picks for 2015”, Traveller describes Rarotonga as being like “one big happy resort, meaning you're not tied to one place and can get out and explore”. They illustrate our amazing landscape so well “mist-shrouded mountains that tumble down to its dreamy azure lagoons” and point out the ease of getting around our little Island. They also say that many of our Island’s are like Hawaii 50 years ago – largely unspoilt and untouched. We love the article, and agree whole-heartedly that the Cook Islands are a Pacific paradise that should be kept a secret no more. If you are deciding on your next holiday, or if you need the perfect tropical island for your wedding, honeymoon or romantic getaway, then you have come to the right place. With daily flights from New Zealand, direct weekly flights from Sydney and Los Angeles, it has never been easier to fly here. We also have a fantastic summer ‘Stay 6 Nights, Pay For Only 5’ offer for our beachfront villa’s. Each villa has its own private pool and you get preferential Spa rates out our multi-award winning Waterfall Spa Facility - that means you have even more reason to visit us! If you would like to stay in a 5-star villa in paradise email our team at [email protected], or phone +682 22551. We can help arrange airport transfers, organise breakfast delivery and guide you on the best restaurants and activities on the Island. We look forward to hearing from you! It has taken a few years of planning, but finally Rarotonga has its first solar plant up and running! The new plant, named Te Mana o Te Ra, was officially opened on Monday by our Prime Minister Henry Puna. The plant was a joint approach with New Zealand energy company Infratec, New Zealands Pacific aid programme and the Cook Islands government, costing around US$2. 6 million. It is estimated that the 3,000 solar panels installed next to Rarotongas airport will provide five percent of our Islands total energy needs, reducing our diesel usage by 400,000 litres a year. The panels were installed with the help of locally trained technicians, who will also help maintain the plant that will be owned and operated by the Cook Islands electricity company Te Aponga UiraThe panels are built to withstand tropical cyclones, high temperatures and salt corrosion. Rarotonga aims to produce 50% cent of its electricity from renewable sources by next year, with a long-term aim to have the island using 100% renewable energy by 2020. This is not a first for the Pacific, the island nation of Tokelau became 100% solar powered in 2012. PowerSmart installed a solar electricity system on all three Tokelau atolls, helping them meet 100% of their climate change obligations. It is estimated that their new solar system will save 12,000 tonnes of CO2 over the life of the plant. The project won PowerSmart the Clean-tech and Sustainability section of the NZ Innovators Awards with a maximum score in every category they were judged on. Tonga, Tuvalu and Samoa are also installing similar solar powered systems. As Air New Zealand is phasing out their 767 fleet their Rarotonga-Los Angeles route will be upgrading to the 777-200s in 2015. This upgrade will potentially grow visitor numbers from the United States as the new planes have a 30% greater seat capacity. This is fantastic news for locals and those of us working in the tourism industry in the Cook Islands. Tourism is the single biggest foreign exchange earner for the Cooks, representing almost 70 per cent of our GDPThe tourism industry supports local growers, shops, businesses, restaurants, accommodation providers and more. In 2013 Air New Zealand said it carried about 200,000 people to Rarotonga from Auckland, Sydney and Los AngelesOf these passenger numbers it is estimated about 7,500 came from Northern America, so with the larger capacity planes this number could increase to nearly 10,000 in 2015/16, along with an expected increase in visitor numbers from New Zealand and Australia. Rarotonga and the Cook Islands are a truly unique destinationUnlike the more populated islands of Hawaii, here you will find almost deserted stunning beaches, quiet roads (there are only 2), and laid back friendly locals who are always smiling and are happy to share stories about their Island paradise. At Rumours Luxury Villas and Spa you can stay in first class luxury accommodation right on the waterfront, with your own pool, spa and beach to relax on. We often have special deals for visitors staying more than 3 nights, and package deals that include a visit to our award winning Day Spa, airport transfers, complimentary car hire, meals and more. Check out Air New Zealands website for Los Angeles Flight Deals, and take a look at our website for great accommodation Package Deals. The Cooks Islands national Independence celebrations Te Maeva Nui are coming up at the end of July. This is considered one of the most important events in the Cook Islands, an annual celebration of self rule granted by New Zealand in 1965. Te Maeva translates as "the major or most important celebration". Every year, dancers and performers from Rarotonga and the outer islands gather at the National Auditorium in Rarotonga to present dances, songs, drum beats and costumes expressing the cultural theme chosen for that particular year. Groups from the 15 outer islands, such as Manahiki, Pukapuka, Penrhyn, Suwarrow, Aitutaki, and Mangaia, also sell crafts and produce from their home on Island Trade Days throughout the festival. This years Te Maeva Nui celebration is themed Te Rakei Tupuna o Toku Matakeinanga translated The Costumes of our Communities & TribesThe week will be celebrated with an International night, featuring entertainment from the different nations living in the Cook Islands, a choir competition, performances and Island days - all showcasing the Cook Islands culture. This years festival kicks off on Monday 28th July, starting with the Te Maeva Nui Float Parade through AvaruaAll the floats will be judged on creativity, ingenuity, and overall presentationThis is to be followed by an official opening ceremony at Punanga Nui markets by the Prime Minister. This will be a fantastic week for tourists on Rarotonga, providing truly authentic cultural experiences with pageantry and fun. There will be many opportunities to try some delicacies and witness some fantastic cultural performances that will showcase the many different faces of the 15 Islands that make up the Cook Islands. The draft programme for the rest of the week can be found on the Cook Islands Tourism Website. Surya Magazine Editor Aine Dowling recently visited us at Rumours Luxury Villas & Spa SURYA (pronounced soor-ya) is a bi-monthly Australian online magazine that covers a wide variety of topics including travel, community, health, fashion, culture, food, entertainment and more. Aine stayed in one of our Platinum Villas, which includes a private pool, spa pool, movie theatre, indoor waterfall, two bathrooms and two four-poster super king canopied beds. "Rumours Luxury Villas and Spaon the tropical island paradise of Rarotonga can offer you a haven of unashamed luxury" "The furnishings are gorgeous, from the beautiful cane four poster love-seat to the huge comfy beds" "Rumours is the perfect place for your luxury Pacific break, honeymoon, or special treat. " You can read the full article here Surya ArticleAll of us at Rumours appreciate getting such a wonderful write-up and we are very proud of the standard of accommodation and service that we provide on Rarotonga. We have specifically designed our Villas to create an atmosphere that one would expect when coming into a World Class standard of luxury accommodation, and the many Awards and positive reviews we receive reflect this. If you would you like to know more about our Platinum Villa please follow this link - Platinum Villa . All our Villas and rates can be found on our website and any "Hot Deals" are also posted to our Facebook & Google+ pages. Waterfall Spa therapists Marciel and Myma. "We had a very relaxing massage each at the Spa at the end of our trip to Rarotonga. It was most enjoyable and professional massage from the 2 masseuses at the Spa. The Spa itself is very well appointed with the running water wall being a lovely feature; the coffee offered on arrival was a very nice addition to their service delivery and complimented the massages which followed. We would definitely recommend the Spa to anyone considering a massage or other form of treatment while in Rarotonga". "Visited Maricel and Myrna at the Rumours Luxury Waterfall Spa Facility on our recent trip to Rarotonga. The girls were great at our treatments selected as a few of our family members visited whilst on holiday, one family member even making 2 trips. Thanks girls, well relaxed and we enjoyed our time at your Waterfall Spa Facility. Would warmly recommend to others". We are so glad to hear such fantastic comments from our Spa guests. We are also very proud of our dedicated and skilled Professional Therapists Marciel and Myma, who go out of their way to ensure guests have a blissful and pleasurable spa experience while in Rarotonga. A luxury spa adds a special dimension to a relaxing holiday, and our staff are so good at paying attention to the little things that make the whole experience so enjoyable. We also appreciate our Waterfall Spa guests taking the time to post a review, and we will share more positive comments about our facilities and service in the future. If you are interested in one of our Waterfall Spa treatments please visit our website for more information. If youre a keen diver or snorkeler and you wish to go on a real adventure while staying at Rumours, you should look at the range of diving and snorkelling packages offered by Reef to See - Adventure Cook Islands diving centre and a PADI registered Dive Resort. Reef to See cater for both highly experienced divers and total beginners. Their Sea Adventures include "guided scuba dive trips to Rarotongas best dive sites, introduction dives, PADI dive courses, outer reef snorkelling trips as well as free diving and bluewater spearfishing trips". Two of the best things about diving and snorkelling in Rarotonga are the pristine clear waters, giving amazing visibility, and the warm ocean temperature, between 23 C in winter and 28 C in summer. With a large lagoon surrounding Rarotonga, and a huge ocean accessible over the reef, Reef to See can offer a wide range of in-water activities and any kind of diving you can imagine. 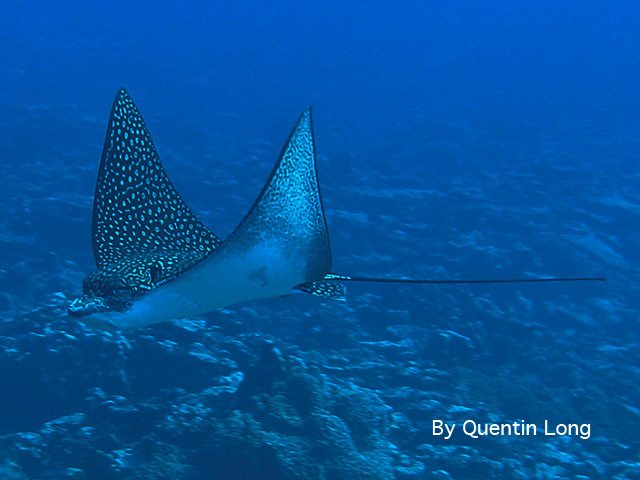 Their guides are also amongst the most experienced dive guides working in Rarotonga. 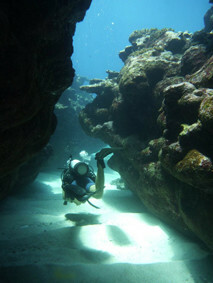 Reef to See offer daily scuba dive tours 7 days a week. Their groups are kept small so they can cater to individual needs , with a maximum number of divers per group kept to 5. If you prefer to snorkel, Reef to See will take you out beyond the reef by boat where you may be able to see eagle rays, reef sharks and turtles. These trips are also offered twice a day, sea conditions permitting. If you would like to find out more about their trips, visit their website Adventure Cook Islands -Reef to See. We have some great news for our guests from New Zealand, Australia, USA, Canada, United Kingdom and the EU - you are now allowed to drive in the Cook Islands using your own current drivers licence. Previously, visitors to the Cook Islands had to obtain a local licence from the Police National Headquarters in Rarotonga, a process that was often time consuming and confusing. The new law, effective immediately, states that visitors aged over 16 are allowed to drive the class of motor vehicle they are entitled to drive in their home country for up to six months. This means that people wishing to ride a motorbike or scooter who are not licensed to do so in their home country still need to obtain a local licence in Rarotonga. Hiring a rental car is a fantastic way to explore the islands stunning beaches, the inland road and tropical gardens. Visitors to the island also love to visit the Saturday Punanga Nui market, and some of the cultural shows on the island. Now the option of driving has become so much easier for our guests, a positive move that we welcome. Note:Visitors whose licences are written in a language other than English will need an accurate translation. All the team at Rumours Luxury Villas and Spa are proud to have once again won the Best Luxury Boutique Spa at the 2014 World Luxury Spa Awards! This is the 4th consecutive year we have taken home the highly coveted World Luxury Spa Award for our Waterfall Spa in Rarotonga, Cook Islands. A special thanks goes to our wonderful Professional Therapists who provide our clients with a superb Spa experience. Recognizing The "Creme De La Creme" After years of success, the World Luxury Spa Awards has once again provided global spa visitors & media with a comprehensive choice of service orientated award winning spas. Providing the industry with reassurance when booking these service orientated spas, the annual announcement of the World Luxury Spa Award winners marks the highlight of a year-long search for the very best as nominated for by spa guests themselves. The winners and finalists were selected by means of an annual voting process where thousands of spa guests from 144 countries have been given the opportunity to vote online in order to have the fairest judging process possible. Competing spas in 2014 included small sized privately owned spas to globally renowned spa groups. The official response and comments from voters where phenomenal. Thousands of votes & feedback came in and as a result key brands and independent spas were rewarded for their extraordinary efforts. Award winning spas are announced on a country, continent and global basis. They stood up to the highest expectations and where tested by discerning spa-goers looking for the ultimate experience where only the absolute best is acceptable. The World Luxury Spa Awards commends and recognize outstanding achievements in service excellence, giving thanks to spas that have excelled. The World Luxury Spa Awards programme put the spotlight on spas world-wide that represent only the finest standards. Marinique de Wet continues: "For participants the World Luxury Spa Awards challenge service excellence and highlight the importance of constant improvement. The Award truly puts the Award winning spas ahead of their peers from a marketing perspective whilst consumers are increasingly using the list of winners and finalists as a reliable guide when booking their spa visits. All guests staying at Rumours Luxury Villas & Spa will receive a preferential 20% discount off all spa treatments. Manicures and pedicures are also available. For more information visit the Waterfall Spa page of our website: Rarotonga Waterfall Spa. Rumours Multi-Award winning Waterfall Spa provides the ultimate relaxation and rejuvenation experience. Our Professional Therapists pride themselves on giving our clients a wonderful experience that will be a highlight of their holiday in Rarotonga. We have just returned from 10 days in Rarotonga it is everything a tropical paradise should beAlthough we didn't stay at the rumours villas we did come in for a lovely massage treatment. Myr came in on her day off to accommodate us and we all had lovely luxurious massages. Myr has magic hands and one of our party had never had a massage before. She came out feeing 3 inches taller and felt like she was walking on air. It was a shame that we didn't have any time to return before heading back to NZ. This would definitely be on our itinerary when we return we are already saving again to come back. A big thanks to Myr for making it so special. We have a range of Massages and Escape Packages available, from 30 minute treatments to the ultimate 3 hour escape that includes a glass of bubbly and a gift. So come and experience our Waterfall Spa Facility on your next tropical holiday, you can phone or email for reservations: Phone: +682 22551 Email: [email protected] com. All guests staying at Rumours Luxury Villas & Spa will receive a preferential 20% discount off all Spa treatments.